Recently I’ve been reviewing the creative ReadWriteThink apps. You may remember Theme Poems and Haiku? Alphabet Organizer is another app by ReadWriteThink, not specifically poetry related, but with lots of possibilities in education. It encourages kids to create an alphabet book or chart with words (or a word and an image) for each letter of the alphabet. It’s available as an online interactive, in iOS and in Android. Older children can take the tool a step further, using the option that allows room for words and notes. It’s ideal for studying vocabulary words or organizing thoughts about a topic. Images can be add into each letter categories, greatly expanding users' ability to make a vibrant alphabet book. Again, this ReadWriteThink app is free, works well, and works straight out of the box. 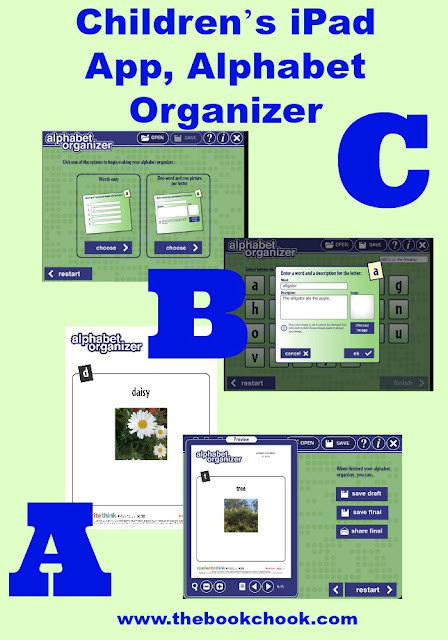 Alphabet Organizer is simple to navigate and I can only start to imagine its applications. Quite young kids who are learning to read might like to photograph and name their toys, keeping their collection in this organizer. Young readers could use it to collect their favourite books or characters, or list words they have learnt how to read. Children who are learning English will find tons of uses - teachers could send kids off with an iPad to photograph playground equipment and then the images discussed, recorded as words and ascribed to the correct beginning letter. If 26 letters (A-Z) is too hard to find, no problem. Older kids may be encouraged to find examples of real-life maths, vocabulary, science, alliteration and other imagery…The app is truly versatile and only limited by our imaginations and purposes. As with Theme Poems and Haiku, children are encouraged to set up a profile and are supported as they proceed through the project. It is saved to the camera roll once finished, as individual jpeg files. I'll be adding this useful tool to my list, Creating with Kids and iPad Apps. I have also previously reviewed ReadWriteThink's Trading Card and Word Mover. You may also like to check out my iPad App Reviews on Pinterest, and find more apps and articles via my Listly page.